Hostel & Cafe Bar Rookies i Novi Sad, Serbia: Bestill nå! 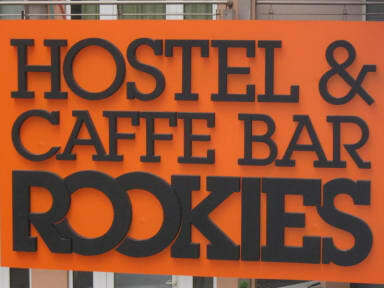 Hostel & Cafe Bar Rookies is hostel located in the very center of Novi Sad situated in Jevrejska street, within walking distance to all major tourist attractions, restaurants, bars, shopping stores and the best nightlife! Designed to be chill out place, where you can relax when you come back tired from the long walks around our city, or perhaps the crazy nightlife. If you want to discover the hospitality of Novi Sad, charming and magnificent city of great night life, reach history and kind people, Hostel&cafe bar Rookies is the perfect starting point. Our reception is open 08-23, and we are really flexible with check out time, in the case that your bed is not booked for the following day. Our location, comfort and atmosphere will guarantee you memorable time in Novi Sad! *Free parking is available (reservation is needed). Guests that are arriving before 09:00 or after 23:00 - contact us in advance at least 24hrs or write us an e-mail after you have completed your booking so that your entry to the hostel can be arranged. An email or an sms would do. Be sure to do that!